Language immersion programs are recommended for those at a level of intermediate Spanish or above. However, more novice levels can attend in certain circumstances. Find Out About Our 8-Day Language Tour! The best way to learn a new language is by immersion in the local culture. It can be even more meaningful when your immersion involves a homestay and a way to better understand the local culture in the process. During our 8-day Language Tour, you will learn Spanish from our language instructors while staying in a local home where you will need Spanish to be able to communicate. With a homestay accommodation, communicating with your host family is not only rewarding but ideal for your skill development. Whether you wish to talk about your day or ask for directions, you will be able to rapidly begin using the Spanish from your daily lessons for everyday activities. For instance, if you want to learn about Dominican cooking, you can volunteer to help with meal preparation while honing your Spanish skills in the kitchen. While the skills development during your homestay is valuable, the full experience you’ll get is so much more. It provides a chance for you to see Dominican culture in a small, quiet neighborhood. Have you ever wanted to be a central part of a day in the life – or a week in the life – of a culture other than your own? You’ll directly experience and interact with the habits, rituals, or attitudes of Dominican culture, hopefully in a way that changes your world for the better. At the same time, your exposure to authentic Dominican culture will extend to visiting schools and other community organizations. There you will use your Spanish skills to learn about the school and share an intercultural exchange. Whether you’re a part of a high school AP class, a college group, or you are teaching yourself Spanish at home, our Language Tours are an excellent way to help you accelerate your Spanish-speaking skills. 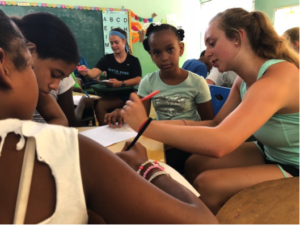 Our programs focus on immersing ourselves in Dominican culture and homes so that we can be placed in an environment in which we maximize our exposure and opportunities to use Spanish. Classroom learning can certainly help, but there is little quite like the experience of learning in an immersive environment. Have Fun While You Serve! While our trip is for service, we also find time for play. We will have a one-day excursion that can feature beaches, white water rafting, horseback riding, and more. The beaches are far different than what you will find in NJ or anywhere in the United States. One group from Montgomery County, PA ended their trip with time on the beach – and happened to be the best birthday one of our students ever had! Contact us and book one of our Language Tours today! While enjoying your time learning Spanish, also know that you are having a sustainable impact on the communities we visit. The money we spend locally lets us leave a sustainable impact on the community we serve. Our trip creates jobs, and we pay Fair Trade wages. We stay in locally-owned hotels or homes and eat at locally-owned restaurants, so that the money we spend in the community stays in the community. Learn About Our Other Service Learning Programs! In addition to Language Tours, we offer a significant number of service learning programs. These trips allow volunteering in a local school or non-profit organization. People can sign-up for our group tours with their school, college, place of worship or other organization – or women can sign-up for our Women’s Weekend. If you want to learn more about service learning opportunities, please visit our page for these programs. If traveling from Chester County, Burlington County, Bucks County, Essex County, Union County, Warren County, Montgomery County, or other locations in PA, NJ, and beyond, there are currently excellent rates on airfare for trips.